Early registration closes at midnight May 15, 2019. Late registration from May 16-18, 2019, incurs an additional late fee of $15 per registrant. Register Today! 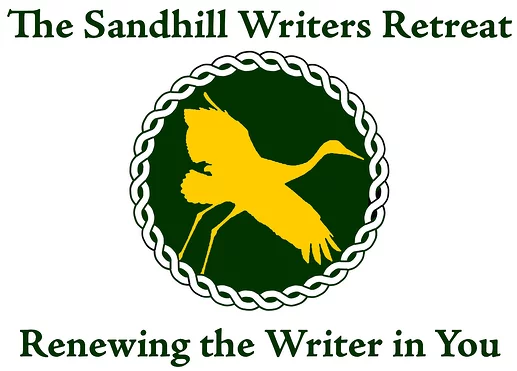 The Seventh Annual Sandhill Writers Retreat will renew the writer in you. The full-day retreat takes place on the beautiful, serene University Campus, located in rural Saint Leo, Florida, approximately 35 miles north of Tampa. The retreat feature sixteen hands-on writing classes in fiction, nonfiction, poetry, poetry performance, and publishing. Classes will focus on lessons in craft and imaginative exercises that lead to new works and new skills. The retreat also includes a faculty reading and book signing, and an optional lunch-time open reading for participants. A very limited number of private one-on-one manuscript consultations are available on a first come, first served basis. Retreat classes will be led by a nationally-acclaimed faculty. Visiting faculty include NPR commentator and author Ravi Howard (Like Trees, Walking; Driving the King), recipient of the Ernest J. Gaines Award for Literary Excellence; nonfiction writer Elisabeth Lanser Rose (For the Love of a Dog; Body Sharers); Poet Laureate of Orlando, Susan Lilley (Venus in Retrograde); Lisa Roney (Serious Daring: Creative Writing in Four Genres; The Best Possible Bad Luck; Sweet Invisible Body), Editor-in-Chief of The Florida Review and Aquifer: The Florida Review Online; and Caleb Sarvis (Dead Aquarium), senior fiction editor of Bridge Eight Press. These renowned writers will be joined by Saint Leo writing faculty members Steve Kistulentz, (Panorama and the poetry collections Little Black Daydreamand The Luckless Age); Patrick Crerand, (The Paper Life They Lead); performance poet Marissa Glover; veteran writer Brooke King, (War Flower: My Life after Iraq); and poets Anne Barngrover (Brazen Creature) and Gianna Russo (Moonflower; One House Down). The Sandhill Writers Retreat is open to writers of all levels who wish to hone the craft and renew the joy of writing. Teachers, students, the military and the general public are all invited to attend. To register for the Retreat, see the Registration tab. Master Classes take place on Friday, May 17, 2019 from 1-4:30pm on campus. To Apply for a Master Class, see the Master Class tab. Ticket sales end May 20, 2019. Independent Publishing Techniques & Procedures (KNOWLEDGE!!! 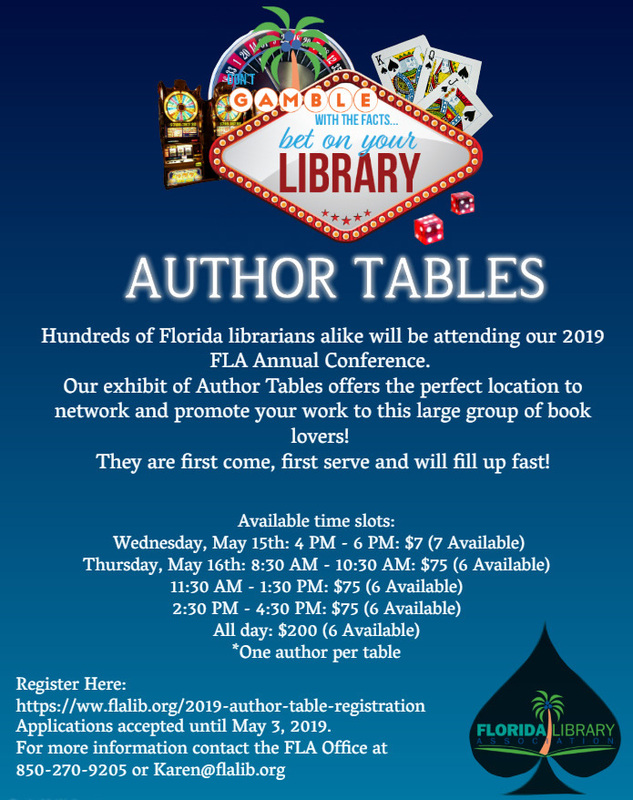 Hundreds of Florida librarians alike will be attending our 2019 FLA Annual Conference. Don't miss out on the opportunity to promote and sell your work to this large group of book lovers! The standard 6 fttables with included linen are located in the Exhibit Hall this year; a perfect location to network. They are first come, first serve and will fill up fast! 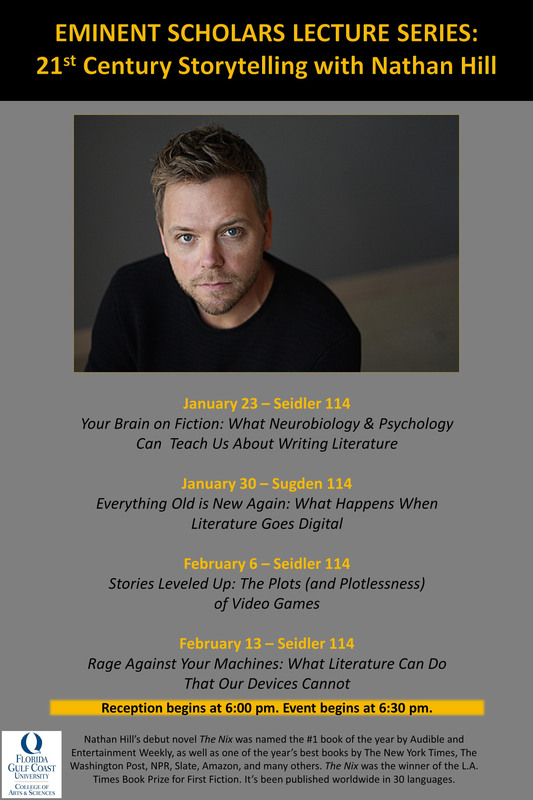 Nathan Hill, best-selling author of THE NIX, brings a four-part lecture series on storytelling in the 21st century to the FGCU community. This event is free and open to the public! It all starts Wednesday, January 23, at FGCU! Doors open at 6:00 for receptions, 6:30 for lectures, to be followed by book signings. It is with great pleasure that I write to inform you about exciting writers’ workshops in Tuscany, In Vino Veritas. Our 2019 offering is rich: the first session is led by acclaimed author/teacher Alison MacLeod (her novel Unexploded was long-listed for the Man Booker Prize), and the second session is a team-taught workshop featuring Jonathan Levi, author of Septimania and Colombian journalist Marta Orrantia, author of Mañana no te presentes. Get ready to mark your calendar, here are the dates: Session I with Alison MacLeod: September 1 – 7, 2019 Session II with Jonathan Levi and Marta Orrantia: September 15 – 21, 2019 Details may be found at: invinoveritaswriting.com and www.grapevineexperience.com In Vino Veritas brings together a small group (limited to a maximum of 15 participants) of international writers who work on memoirs, fiction, and poetry, learning about writing in the morning and wine in the evenings. All is accompanied by exquisite food and conversation. The backdrop to this exciting week is the Donatella Cinelli Colombini wine estate in Trequanda, south of Florence, not far from Siena and near Montalcino (home to the prize-winning Brunello wine, of which Donatella is also a producer!). Please do not hesitate to contact me for an electronic brochure or more information. And do spread the word to your friends and all those you think might be interested. I look forward to welcoming you to a session of In Vino Veritas! Cin-cin! Cheers! Suzanne Branciforte Director Grapevine Experience Palazzo Sergardi, Siena www.grapevineexperience.comPlease share this 2019 North Port Poetry Workshop Schedule with poets and friends. Attached you will find the monthly meeting dates and times, as well as the Open Mic Events. Let's make 2019 a year to "grow" poetry in North Port! Each year, FAPA holds the FAPA Annual Conference, the premier educational and networking event for authors and publishers in Florida. The 2019 FAPA Annual Conference will be held on August 2 and 3, 2019 at the Hilton Orlando Buena Vista Palace. The FAPA President’s Book Awards Banquet will be held on Saturday evening, August 3, 2019, after the conference. The 2018 FAPA Annual Conference was held on August 3rd and 4th, 2018 at the Hilton Orlando Buena Vista Palace. This exciting networking and educational event offered two days of sessions with a focus on The Business of Publishing. Industry leaders, including Charles Todd, Lisa Black, Angela Bole, and Dianna Collier, shared their expertise and a variety of tools needed to flourish in this evolving publishing environment. For the first time, the conference featured a pre-conference workshop and an onsite bookstore where FAPA members and book award medalists could sell their books. Save the dates on your calendar for these great opportunities in 2019 to learn, network, and grow your business. Visit the FAPA website. Early registration closes at midnight May 15, 2019. Late registration from May 16-18, 2019, incurs an additional late fee of $15 per registrant. Hundreds of Florida librarians alike will be attending our 2019 FLA Annual Conference. Don’t miss out on the opportunity to promote and sell your work to this large group of book lovers! The standard 6 fttables with included linen are located in the Exhibit Hall this year; a perfect location to network. They are first come, first serve and will fill up fast! The Kauai Writers Conference has grown to become one of the foremost literary gatherings in the US, and takes place every year in November on the beautiful island of Kauai. We are blessed to live here and would like to invite your members to join us. This year’s conference has already confirmed, among other distinguished best-selling authors, Paula McClain, Christina Baker Kline, Greg Iles, Geraldine Brooks,Tony Horowitz, Lisa Wingate, Meg Wolitzer, Mark Kurlansky, Tea Obreht, Nicholas Delbanco, Richard Bausch and Whitney Scharer. Our growing 2019 faculty of fiction and non-fiction writers is regularly seen on the New York Times best-seller list and count among their many awards and honors: the Pulitzer Prize, fiction; the Pulitzer Prize, national reporting; Orange Prize for Fiction; National Magazine Award; O. Henry Prize; National Book Award (finalist); The Pushcart Prize; Overseas Press Club Award; PEN/Malamud Award, to name just a few. We’re pleased to present members of the Gulf Coast Writers Association with a discount of 20% on both the general conference and master classes on various aspects of the craft. The event also offers one-on-one sessions with literary agents, editors and publishers. 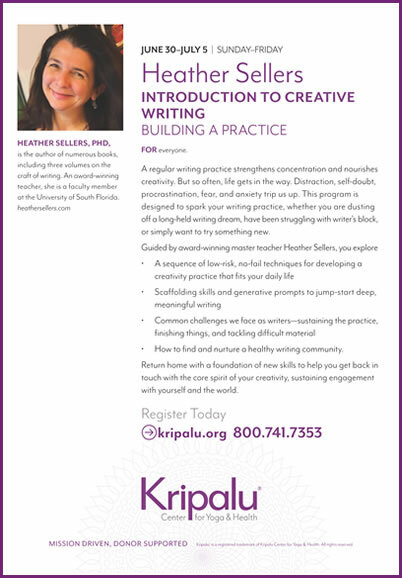 I invite you and your members to spend time on our website and learn more about this nationally-recognized conference, offering an acclaimed faculty committed to sharing their knowledge and time in intimate small group sessions with writers from around the country. It is with great pleasure that I write to inform you about exciting writers’ workshops in Tuscany, In Vino Veritas. Our 2019 offering is rich: the first session is led by acclaimed author/teacher Alison MacLeod (her novel Unexploded was long-listed for the Man Booker Prize), and the second session is a team-taught workshop featuring Jonathan Levi, author of Septimania and Colombian journalist Marta Orrantia, author of Mañana no te presentes. In Vino Veritas brings together a small group (limited to a maximum of 15 participants) of international writers who work on memoirs, fiction, and poetry, learning about writing in the morning and wine in the evenings. All is accompanied by exquisite food and conversation. The backdrop to this exciting week is the Donatella Cinelli Colombini wine estate in Trequanda, south of Florence, not far from Siena and near Montalcino (home to the prize-winning Brunello wine, of which Donatella is also a producer!). Please do not hesitate to contact me for an electronic brochure or more information. And do spread the word to your friends and all those you think might be interested. I look forward to welcoming you to a session of In Vino Veritas! Please share this 2019 North Port Poetry Workshop Schedule with poets and friends. Attached you will find the monthly meeting dates and times, as well as the Open Mic Events. Let’s make 2019 a year to “grow” poetry in North Port! Each year, FAPA holds the FAPA Annual Conference, the premier educational and networking event for authors and publishers in Florida. The 2019 FAPA Annual Conference will be held on August 2 and 3, 2019 at the Hilton Orlando Buena Vista Palace. The FAPA President’s Book Awards Banquet will be held on Saturday evening, August 3, 2019, after the conference. The 2018 FAPA Annual Conference was held on August 3rd and 4th, 2018 at the Hilton Orlando Buena Vista Palace. This exciting networking and educational event offered two days of sessions with a focus on The Business of Publishing. Industry leaders, including Charles Todd, Lisa Black, Angela Bole, and Dianna Collier, shared their expertise and a variety of tools needed to flourish in this evolving publishing environment. For the first time, the conference featured a pre-conference workshop and an onsite bookstore where FAPA members and book award medalists could sell their books. Save the dates on your calendar for these great opportunities in 2019 to learn, network, and grow your business. Meetings 2nd Wednesday of the month 6:00 – 8:00 p.m.